In 2005, after I had applied for the Masters in Mediation program at Woodbury College, I sat down with the Admissions Director for an informational interview. "Would the program involve much conflict?" I asked her. In retrospect, how embarrassing. A mediator's main job is to be calm in the midst of sometimes stormy conflicts, helping disputants move toward mutually acceptable solutions. That may be a simplification of Ury's book, but this basic question has served me well whenever a no was emotionally difficult, inconvenient, and/or requiring some level of sacrifice. Though Ury's subtitle, "Save the Deal, Save the Relationship and Still Say No," focuses on interpersonal conflict, I have found the positive no formula helpful in many situations. For example, I have said no to quite a few things that I previously enjoyed -- nail polish, hair driers, meat (mostly), clothing driers, etc. -- because the "yes" is so much bigger: a clean, livable climate for future generations. Then again, we all are in relationship with the climate, with the generations who will follow us, even with our own consciences. Maybe it is all about relationships after all. In any case, this is not just a personal tool -- saying no to get to yes can be powerful with big picture disputes as well. The Standing Rock Sioux protest against the Dakota Access Pipeline is an inspiring example. I don't want to speak for the determined water protectors, but what I see is a strong no to the pipeline, no to fossil fuel infrastructure, and no to the possibility of a devastating pipeline break and oil spill -- all based on an unwavering yes to water, to life, to future generations, and to sacred lands and spiritual traditions. Of course, a positive no is more complex than simply focusing on yes, because we all are in relationship with one another. It is often both desirable and advisable to consider other options. For the global climate action movement, for example, it is insufficient to just say no to the hardworking women and men in the fossil fuel industry. We do need to say no to fossil fuels, for sure -- but these folks need jobs and incomes. For sure. Thus the climate action movement also advocates for a just economy with alternative livelihoods for these families and communities -- such as, building green energy infrastructure. On a personal happiness level, sometimes yes is just yes. Whether it's practicing meditation, being a better listener, or simply smiling more, many positive psychology tools don't require saying no. Our brains are not happy when we act in discord with our values and morals. Doing what my own brain believes is the right thing increases my happiness. The happiness hit from buying stuff is short lived. There are always prettier clothes and shinier trinkets. Limiting my spending also means liberating some of my time. Since I am not working simply to pay a department store credit card, I am freer to choose a career based on passion, not paycheck.
. When my daughter was nearing the end of her pregnancy, I absolutely said yes to driving from Vermont to Alabama to be there for her in the weeks before and after she gave birth. This meant saying no to the Happiness Paradigm Store and Experience, an enterprise I had started less than six months earlier. I shut it down for two months, just when I should have been building the new business. Instead, I built a closer relationship with my daughter and a deep, deep bond with my grandchild. It was a good happiness choice for us all. Back to the systems level, I think the power of a positive no may be even more helpful as we move toward a gross national happiness paradigm. To embrace policies and political and economic philosophies based on a holistic "yes!" to the maximum well being for all people and the planet will require some really tough "no's" to the dominance of a consumerism-obsessed, money focused, growth economy-insistent, gross national product way of thinking. To state the obvious, it will not be easy. Big jobs are easier broken into bite size pieces. The Bhutanese, who have a gross national happiness system in place, have done that for us, dividing the big picture into nine "domains" -- areas where government policy can best support well being. The nine are: psychological well-being, physical health, time balance, community vitality, education, culture, environment, good government, and standard of living. Not that any of these is really bite sized. Still, this division makes it a bit easier to envision what to say no to, and what the yes might be. Take trust in government for example. I suspect there is a broad consensus for saying no! to the corrupting influence of money in politics, in order to say yes to healthier democracy. However, since, campaigns will still need to be financed, the no is insufficient without an alternative vision -- like public financing of congressional campaigns. This example, like so many others, provides no panacea. Money will find a way to seep back in. John Gardner, the founder of Common Cause, once quipped that those who reform systems and those who scheme to undermine those reforms should make an appointment to meet up several years after the reforms are passed -- because, by then, it will time for new reforms. 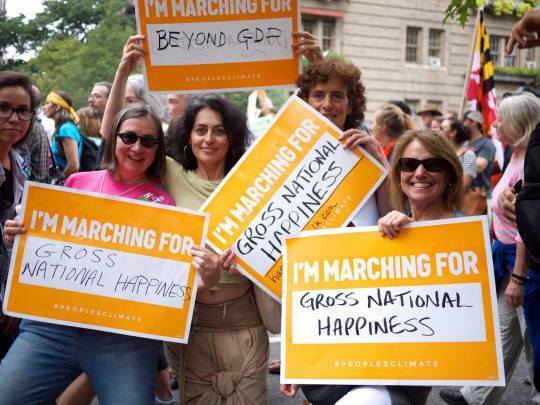 Obviously, gross national happiness advocates are not trying to create a utopia. Rather, while we say no to a framework that no longer supports well being for either people or the planet, we say yes to new definitions of success that are more complete, more sustainable, and much happier for many more people. It's going to be a heckuva journey getting there, but journeys start today with one small step. You can make that small but significant step today: say yes to happiness by signing the Charter for Happiness. There will be plenty of time to say no all along the way. Right now, all you need to do is say yes. Yes, yes, yes!